A slow reverse rising aerial establishing shot of the Austin, Texas skyline with the Colorado River in the foreground. Overcast late Fall day. A slow reverse aerial view of traffic flowing over the S Congress Avenue Bridge over the Colorado River in downtown Austin, Texas on an early autumn evening. A slow forward low aerial view of traffic flowing over the S Congress Avenue Bridge over the Colorado River in downtown Austin, Texas on an early autumn evening. 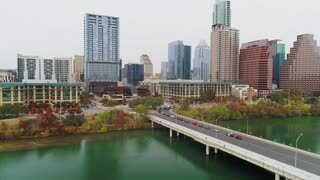 A daytime overcast aerial view of traffic flowing over the S Lamar Boulevard bridge in downtown Austin, Texas on an overcast winter's day. AUSTIN, TX - Circa December, 2017 - A slow rising reverse aerial establishing shot of Austin, Texas and the Colorado River on an overcast day as traffic flows over the S 1st Street Bridge. An early evening exterior static establishing shot of traffic flowing over the Congress Avenue Bridge in downtown Austin, Texas. An early evening rush hour view of traffic flowing over the S Congress Avenue Bridge over the Colorado River in downtown Austin, Texas. A tilt down aerial establishing shot of the S 1st Street Bridge over the Colorado River in downtown Austin, Texas on an overcast Winter day.